[prMac.com] Hamburg, Germany - Claus Zimmermann announced the release of his new app, Cover Lights 1.0. The App controls the user's Philips Hue bulbs to adjust the room lighting according to the music track currently being played in iTunes. When starting a new music track in iTunes, the App automatically analyzes the colors of the album artwork to tint the user's Philips Hue bulbs accordingly. To many people album covers are pieces of artwork. The colors used in the album artwork reflect the mood of the music. Now with Cover Lights and with the Philips Hue bulbs, users can experience the mood of their music visually through their room lighting while they are listening to their favorite tracks. The App is designed for ease of use. It analyzes the color setting of the album artwork automatically, if the user is not happy with the App's automatic color selection, they can simply click on the menu bar of OS X to adjust the color selection by using the drag'n'drop option. 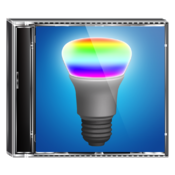 Cover Lights 1.0 is $1.99 USD (or equivalent amount in other currencies) and available worldwide exclusively through the Mac App Store in the Music category. Claus Zimmermann is an independent software developer since 2011. His focus is to develop creative, easy-to-use Apps for the Mac and iOS platform. Copyright (C) 2013 Claus Zimmermann. All Rights Reserved. Apple, the Apple logo, iPhone, iPod and iPad are registered trademarks of Apple Inc. in the U.S. and/or other countries. Philips and Hue are trademarks of Koninklijke Philips Electronics N.V.